A London start-up has condensed the power of cloud based visual search technology to the size of a book- called the Pholio- which provides private control and AI-powered, content-based search. The software in Pholio automatically checks all images in your collections against 20,000 in-built search terms, from ‘birthday’ to ‘christmas’ and ‘house renovation’. By keying a relevant search term into a browser on a connected TV screen, tablet, phone or laptop at home, families can search for all sorts of things in their own photo collections – from day trips to Bangor to bungie jumps in Niagara. Pholio was trained in the lab by showing it millions of images with a wide range of content. A custom set of deep learning algorithms has learnt how to create a unique summary of the contents of images so Pholio can recognise and classify faces, objects and scenes that it has never seen before. Pholio has been trained to recognise 20,000 search terms which can be used fully offline. If Pholio is connected to the internet, owners can search for anything (Pholio can learn new search terms on the fly based on what users search for). The technology within the Pholio box will evolve for individuals based on their specific interests and collections – each box will end up understanding different things depending on its owner. It will be a boon for collectors and hobbyists who can train their systems to recognise the things they care about. From stamps to birds, cars, shoes or handbags, the device allows detailed exploration and sorting based on what it learns about the collections. Pholio is now taking pre-orders. 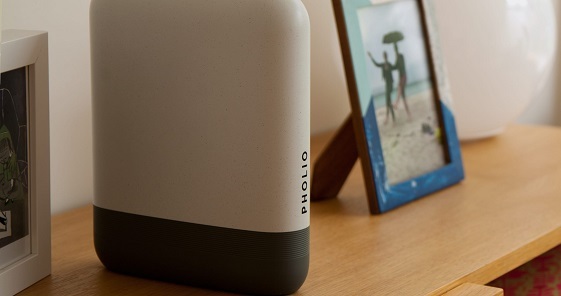 The Pholio device, with built-in search capabilities, is available from £199 for early orders. 1850s The earliest photo albums created. Owners often put the albums on display and they featured ornate illustrations surrounding the images. 1997 Philippe Kahn instantly shared the first pictures from the maternity ward where his daughter Sophie was born. He wirelessly transmitted his cell phone pictures to more than 2,000 family, friends and associates around the world. Kahn’s wireless sharing software and camera integrated into his cell phone signalled the birth of instant visual communications. Kahn’s cell phone transmission is the first known publicly shared picture via a mobile phone.